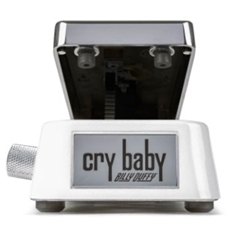 The Billy Duffy Signature Cry Baby Wah combines two different wahs in a single housing so you can change between modern and classic sounds on the fly. Billy Duffy Signature Cry Baby Wah features convenient auto-return switching--so you can step in and out during riffs and solos--with an internal control to set the bypass delay when you lift your foot. Two more internal controls adjust the toe-down frequency of both the GCB95Q and Ronson modes.